The success of percutaneous vertebral augmentation (PVA) relies on the quality of its bone cement. To relieve the pain that accompanies pathologic vertebral compression fractures, cement must be injected into affected vertebra with precision and control. To accomplish this, Merit Medical launched its proprietary StabiliT Bone Cement that offers physicians two significant advantages over other cements on the market. Using conventional high-viscosity bone cement often translates into shorter working times. Merit’s StabiliT Bone Cement maintains its high-viscosity with a working time of 35-minutes. 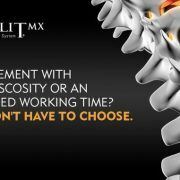 When used with the original StabiliT Vertebral Augmentation System, higher levels of radiofrequency (RF) energy are initially applied to the cement to increase its viscosity but then taper off over the length of the procedure. This allows control of the polymerization, making the delivery of high-viscosity cement over an extended working time possible. Maintaining this viscosity has its clinical benefits especially when managing common complications like cement extravasation. According to Dr. Brower, whether a physician is treating pathologic fractures or osteoporotic fractures, cement potentially leaking outside of the vertebral body is a widespread concern but one that a highly viscous cement can ameliorate. 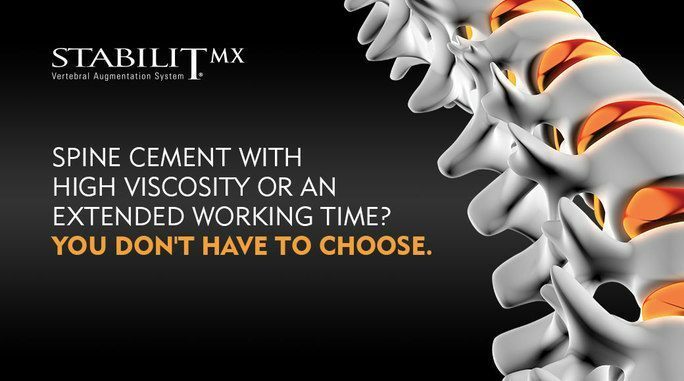 To offer these same benefits to physicians with varying clinical needs and patient requirements, Merit introduced the StabiliT MX Vertebral Augmentation System—a simplified system that only requires the use of a precision syringe to deliver high-viscosity cement. Limited working time and unreliable cement viscosity have often left physicians rushing to complete a procedure. StabiliT Bone Cement’s versatility and many clinical advantages, mainly its extended working time and dependable high-viscosity, have made it the bone cement of choice. Alicia Armeli and Dr. Brower are paid consultants of Merit Medical. For more information please refer to Instructions for Use. Consult product labels and inserts for any indications, contraindications, potential complications, warnings, precautions and directions for use. Learn the demographics, diagnoses and most current clinical evidence regarding minimally invasive procedures for the treatment of pathologic vertebral fractures and spine tumor ablation. Have you signed up for the September Think Access™ training course yet? September’s training is the first time that superpowers have been combined, adding comprehensive training for both the HeRO®/Super HeRO® Graft and for Peritoneal Dialysis (PD) systems. We are happy to announce that training for this exclusive course will be held at the VISTA lab in Baltimore, Maryland Friday, September 15th through Saturday the 16th. HeRO Graft and PD training at VISTA means you’ll have the opportunity to learn cutting-edge skills and have access to the latest technologies that will help support the advancement of your interventional and surgical procedures. September’s Think Access course is like no other because you’ll be able to rehearse, perfect, and perform techniques using cadavers (HeRO portion only) and simulators in a state-of-the-art facility. Broken up into two groups for more individualized instruction, training such as placing new implants and catheters as well as complications/tips and tricks will be covered. For HeRO, you’ll revisit existing implants, placement of the venous outflow component from different access sites, identifying the anastomosis and tunneling will be addressed. These topics will be put into practice again in the SIM Lab using VISTA’s advanced training models. Clinical discussions will also be taking place throughout the course that focus on PD and HeRO Graft tips, troubleshooting, and clinical guidelines. You’ll be invited to dive into several case study discussions with other physicians, enabling you to familiarize yourself with HeRO and PD clinical scenarios that will help prepare you for challenging cases. You’ll be taught by two of the foremost thought leaders, John H. Crabtree, MD Chair of PD University for Surgeons-North America and Jesse Garcia, MD, Vascular Surgeon at MedStar Heart & Vasculature Institute at MedStar Washington Hospital Center. 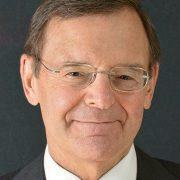 Dr. Crabtree has pioneered modifications and enhancements to the laparoscopic placement for peritoneal dialysis patients and has authored numerous articles covering dialysis catheters, implantation techniques, and resolution of dialysis access complications. He currently serves as Visiting Clinical Faculty at Harbor-UCLA Medical Center and as the Activity Director for ISPD-sponsored surgeon education programs for Europe. Institute (MHVI) that is performing the greatest volume of HeRO™ graft placements in the country. 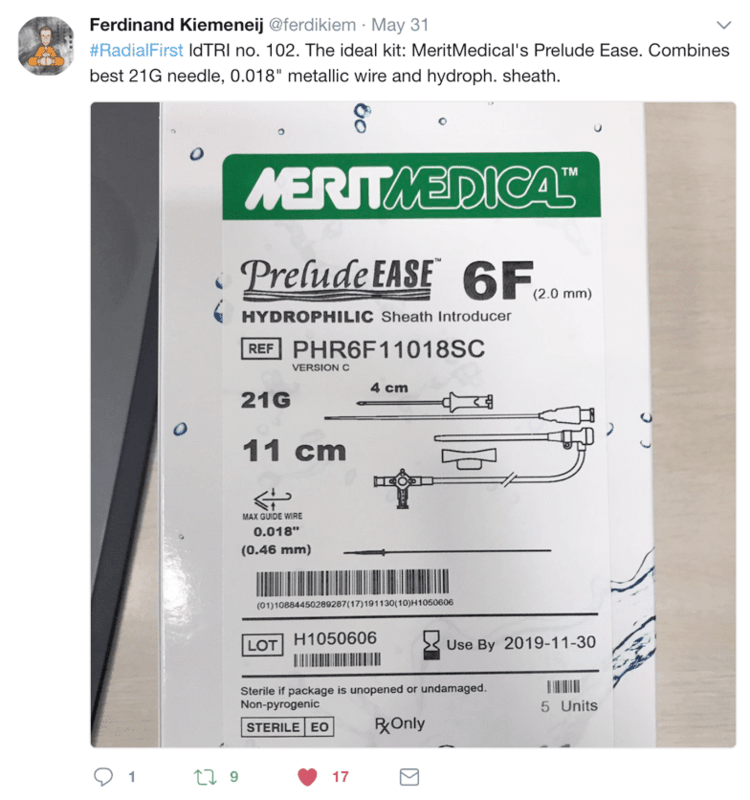 This unique new technology has made a dramatic impact on patients’ lives because it reduces significantly the risk and frequency of infection associated with the standard venous catheter use. 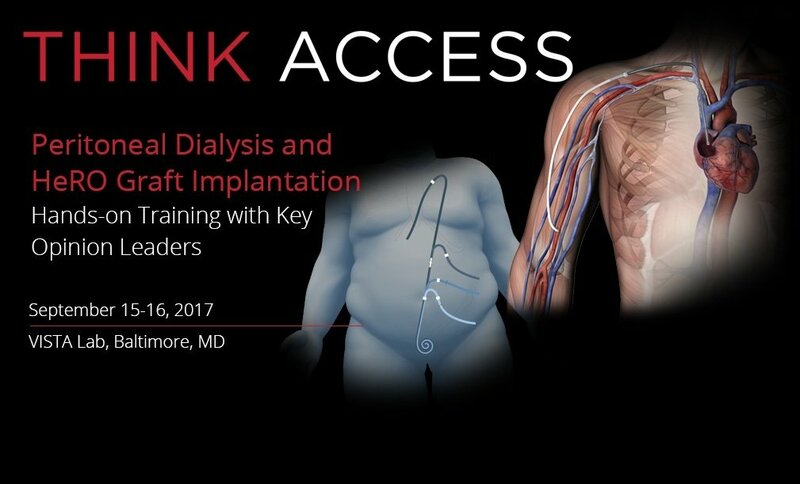 Sign up today to be part of September’s special Think Access training held at the VISTA Lab in Baltimore. We look forward to seeing you there! Merit Medical is committed to the radial approach, with a comprehensive portfolio of radial products supporting radial procedures from set-up and access through hemostasis, as well as the ThinkRadial training program for Interventional Cardiologists and Radiologists. And in this year, the 25th anniversary of radial access, we are happy to spotlight some of our key radial products, starting with the sheath used to gain access to the radial artery. 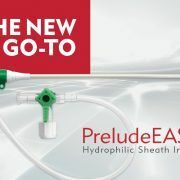 The PreludeEASE™ maintains a robust design that resists kinking while still providing a large inner diameter for increased device compatibility. 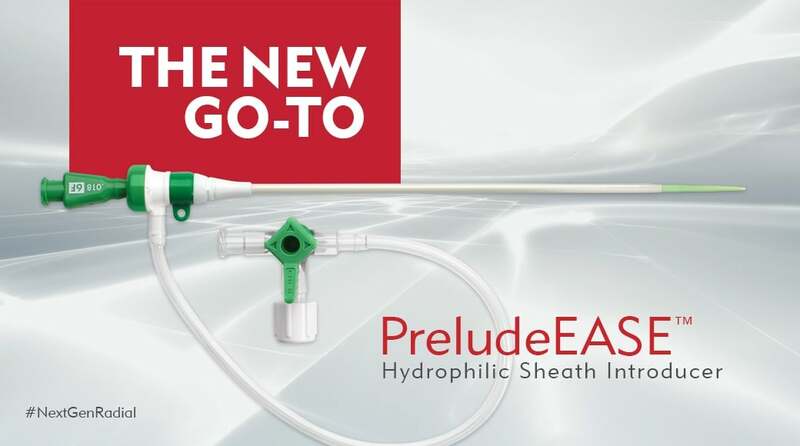 Combining a slim profile and a large inner diameter, the PreludeEASE provides optimal dimensions without compromising integrity or performance. Kiemeneij F, Fraser D, Slagboom T, Laarman G, van der Wieken R. Hydrophilic coating aids radial sheath withdrawal and reduces patient discomfort following transradial coronary intervention: a randomized double-blind comparison of coated and uncoated sheaths. Catheter Cardiovasc Interv. 2003 Jun;59(2) 161-4.